Over time, the overhead pipes in a parking garage can collect exhaust soot, dust and spider webs. Parking garages often have low ceilings, putting overhead utility pipes are in a driver’s line of sight. If these pipes have a pile of black soot and dust on top of them, your tenants and visitors will surely notice. Sometimes the dirt on the pipes is more visible than the dirt on the parking garage surface. The best time to clean your parking garage pipes is while your garage is being pressure washed. This is because the same equipment that is used to clean concrete can be used to clean overhead pipes. And if this is done at the same time, the pipes can be cleaned, and the soot and dust that is knocked off is washed away when the parking garage surface is pressure washed. Usually, these pipes have simply accumulated dust an high pressure is not needed to get them clean. When they are cleaned with a pressure washer, a safe distance should be maintained so that insulation, sprinkler heads or electrical pipes are not damaged. Many parking garages have an overhead fire sprinkler system. If your garage has this system, be sure to put it into “test” or “maintenance” mode during the wash. This way if a sprinter head is set off from the heat or damaged by the water, it can be replaced easily without setting the system off and shooting water into the parking garage. 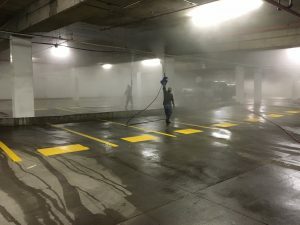 Parking garage pressure washing requires a lot of skill and experience. Be sure to find a company that can handle your project. Otherwise, you are taking a big risk. C & D Commercial Services specializes in parking garage pressure washing and cleaning overhead pipes in parking garages. We have been pressure washing garages and overhead pipes for more than three decades. During this time, we have gained the knowledge and expertise to do this efficiently and safely. We often pressure wash overhead pipes at our client’s request. In the above photo, we are cleaning pipes in a parking garage in Uptown, Dallas. Find out more about our pressure washing services.